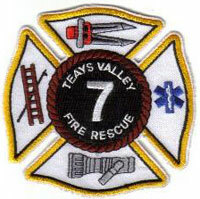 In 1963 the Teays Valley Lions Club decided that the area needed a local Fire Department. After long discussions it was decided to sponsor the beginning of a volunteer fire department. On July 20, 1964 the State of West Virginia, signed by Joe E. Burdette, Secretary of State signed Incorporation papers. Object for Incorporation: Establish, organize, operate and maintain for benefit of the community a volunteer fire department. Our first apparatus was a 1942 LaFrance Pumper received from Kanawha County Airport and an old gasoline tanker. These vehicles were housed at Teays Valley Exxon until a station could be built. In 1965 plans for a 60' x 40' building were started and the building still serves us to this day as our main station. Our department is an all volunteer department currently led into action by Chief John Smoot. We consist of 35 members who come from a variety of backgrounds and training. We are always taking new applications. If you are interested please stop by the main station and fill one out.